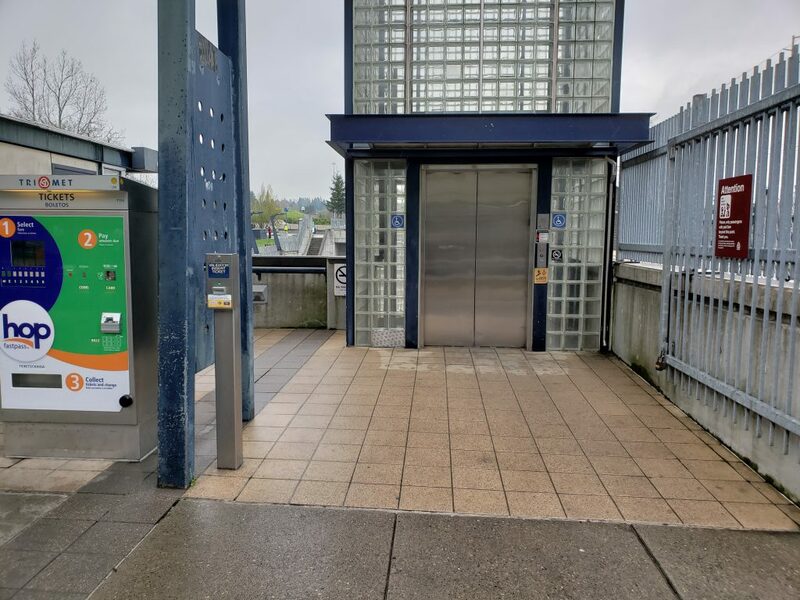 TriMet will begin making improvements to elevators at the Sunset Transit Center starting Monday, April 29. 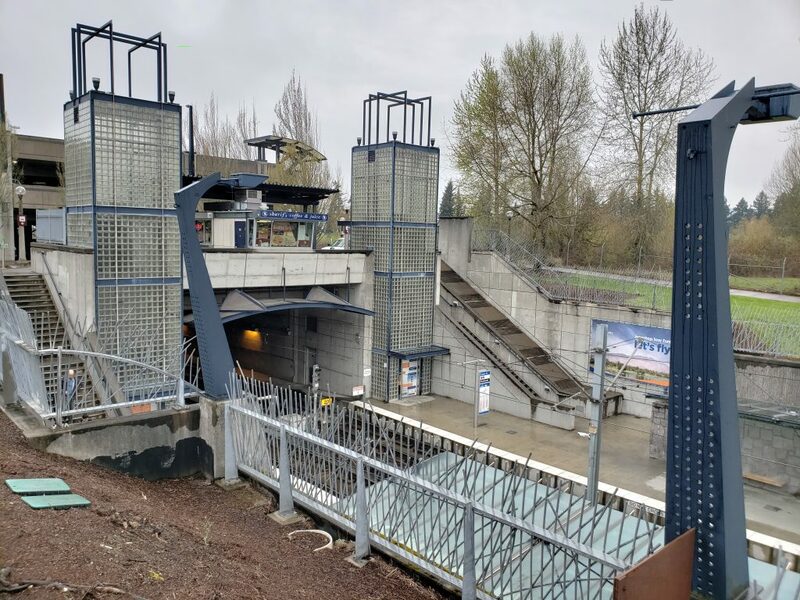 While the work is similar to the improvements made at MAX stations along I-84 in northeast Portland, it will not block access to the station for those who must use the elevators to reach the platforms. We’ve already completed major overhauls to elevators at two other MAX stations – NE 60th Ave and NE 82nd Ave – and we’re wrapping up work later this month on the one at Hollywood/NE 42nd Ave Transit Center. Like those projects, the work at the Sunset Transit Center will take about 14 weeks per elevator and ensure they remain safe and more reliable far into the future. 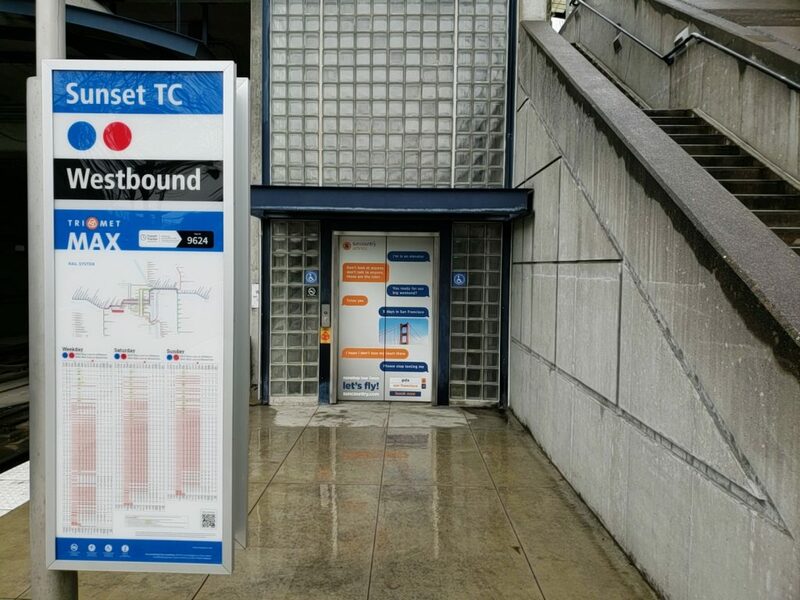 Sunset Transit Center is the second-busiest transit station on the westside, serving the MAX Blue and Red lines, as well as five bus lines. With more than 8,000 trips starting or ending at the transit center each weekday, the elevators are heavily used as they’re the only way to get between the plaza level and the MAX platforms, other than the stairs. To reduce inconvenience to those who are unable to use the stairs at the transit center, we’re closing one elevator at a time. A pathway at the east end of the station, usually only open to TriMet staff, will be open to riders to go between the platforms during the elevator improvements. During the closure of the westbound platform elevator, those who cannot use the stairs will need to use the elevator to the eastbound platform, go to the opposite end of the platform (about 200 feet) and then cross to the westbound platform. After exiting westbound trains, head to the east end of the platform, cross over to the eastbound platform and head to the west end where the open elevator will be. When using the crossing, riders should use caution, look both ways and only cross when a train is not approaching – from either direction. Plan a few minutes extra to reach the other platform if needing to use the path. While the elevators are closed, crews will replace all the components of the elevator cabs including electronics, mechanical equipment, and the panels and doors. They’ll improve the canopies on top of the elevator towers to help protect against extreme weather, and also add heat detectors at each elevator landing to increase fire safety measures. One week before work starts at Sunset Transit Center, we’ll begin similar renovations to the elevator at our Gresham Parking Garage. Starting Monday, April 22, those unable to use the stairs should park on the ground level. A number of spaces on the ground floor are set aside for those with disabled parking permits, and we’ll set more aside if it becomes necessary. Along with replacing the doors, panels and all the components of the elevator cab, crews will be installing new LED lighting at each elevator landing in the parking garage. The work should take about three months to complete. In spring, 2018, TriMet launched a multi-year, $22 million improvement program to upgrade or replace 19 elevators throughout our system. It’s part of our commitment to make transit better, with ongoing upgrades to vehicles, stations and tracks that improve reliability and make the ride more comfortable.